These photos were taken this afternoon. As yet it doesn’t have its ‘pods’ attached. Lots of men in high-vis jackets were busily working around the base of it. Apparently work was delayed yesterday because of the high winds. Though I was very opinionated on these pages about the previous plan to put the wheel within the old abbey wall, near the Museum Gardens, I’ve nothing against big wheels in general, and had a walk up to town in the cold today to see how things were progressing. Here’s a bit of it in silhouette, from the Museum Gardens across the river, with a rather older bit of metalwork in the foreground. 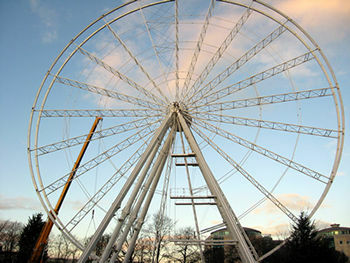 Since the original observation wheel at the NRM rolled off away from the city the wheel operators have been trying to find another site in the city centre. 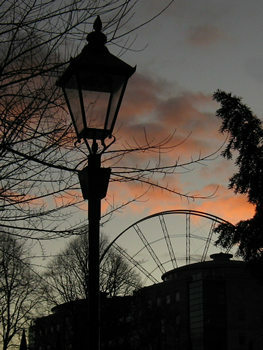 Last December, particularly controversial plans (covered at length already on this site) were put forward to put the wheel on land to the north of the Museum Gardens, behind the art gallery. This December we have the wheel going up not far away, on the other side of the river, not far from the original wheel site at the NRM. Personally I’m glad we’ve found somewhere to put it, for the sake of the many people who I know were disappointed at the failure of previous plans. And perhaps because the earlier proposal was so bad and I’m so relieved that scheme was abandoned. Previous to last winter’s application I had no particular interest in big wheels, and don’t remember the last one going up at all, just that it was there, and I wandered past and took some photos of it. This time, I was quite interested. The first time I saw it, across the open space of Marygate car park, having turned the corner from the pedestrian ‘tunnel’ under the railway line by Bootham Terrace, it did make me say ‘Wow’. It’s a rare thing to have something so dominant appear suddenly on the skyline. I don’t find it beautiful, but don’t find it ugly either. I know many people hate big wheels, and hate that this one is here on the York skyline, and I respect that opinion, and understand it. Particularly we should spare a thought for the residents of Westgate Apartments, close to the wheel site. Those apartments have large windows, many facing the Royal York Hotel gardens, now facing an enormous great wheel. Having read through the objections/comments submitted in response to the earlier application, I also had a read through objections to this one. This plan didn’t seem to have alarmed too many people in the wider community. Of around 35 objections I saw only a couple from people who didn’t live in Westgate Apartments. The earlier application prompted a large number of objections from all over the city and also from its surrounding villages and suburbs. For obvious reasons, already covered here and elsewhere. So though it’s clearly a total pain for the residents nearby, the perceived advantage to the wider community overrides that, I guess. It certainly seems to be a slick and fast-moving operation. If only we could have sorted out plans for Coppergate, York Central etc so quickly. Not only has the wheel taken recognisable shape, but work on what seems to be a new pedestrian entrance looked to be almost complete on 9 December. The ‘yes’ was granted on 24 November. 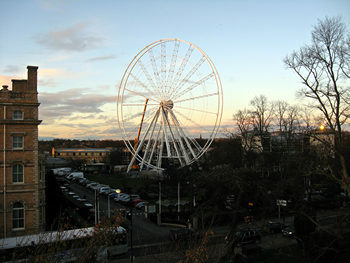 So here we are, we have a big wheel, rushed over from its previous site in Dublin. Permission has been given to run it on this site until January 2013. Rumours are already circulating that it may be taken down long before then, as its sudden appearance in the gardens of the Royal York hasn’t been unanimously welcomed by those who had planned a summer wedding at the Royal York, taking advantage of its ‘beautiful gardens’. 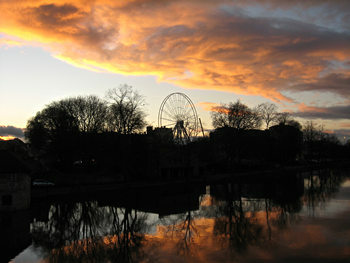 A previous application to site the wheel on land behind the Art Gallery, to the north of the Museum Gardens, was submitted in December 2010, and later withdrawn. I’ve left in place on this site the page on the previous application, in case it’s of interest. The page contains links to background information, and reactions to the plans.